location of the Pays de Retz, south of the Loire in the Duchy of Brittany. The Pays de Retz is a historical region of France that currently forms part of the Loire-Atlantique department, but which previously formed part of the Duchy of Brittany. The area lies between the southern shore of the Loire estuary and the Marais breton (Breton marshlands), bordered to the west by the Baie de Bourgneuf (Bourgneuf Bay) and on the east by the Lac de Grand-Lieu (Grand-Lieu Lake) and a network of small rivers. Its main towns are Rezé, Pornic, Paimbœuf, and Machecoul (the historical capital city). 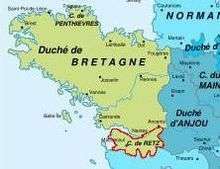 In the early 9th century the area formed part of Frankish territory, but was coveted by the Breton ruler Nominoe. Nominoe and his son Erispoe won a series of victories over the Franks between 843 and 851, resulting in the Treaty of Angers (851) between Charles the Bald and Erispoe, which gave "Ratense" or Pays de Retz to Brittany. In subsequent centuries there was conflict between Brittany and Anjou over the area. The notorious medieval serial killer Baron Gilles de Rais was from the area, and murdered and raped a large number of local peasant children. During the War in the Vendée of 1793, the area was a Royalist stronghold. Harvesters of the Bay, a documentary on Pays de Retz salt harvesters. This article is issued from Wikipedia - version of the 10/7/2014. The text is available under the Creative Commons Attribution/Share Alike but additional terms may apply for the media files.